Double-Bonus for Inviting Friends. Give 1000. Get 1000. We like you. A lot. In fact, we can’t get enough of you. But alas, since there is only one of you, we’d like you to meet our friends. 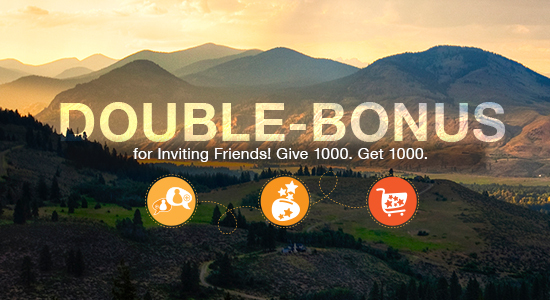 For two weeks, we’re DOUBLING our invite friends bonus from 500 to 1000 points. From now until April 15th, invite your friends to join Stash. When they join, they’ll earn 1000 points right away. Then, once they complete their first point-earning stay, you get 1,000 points too. Get your invite code and score some points! I previously invited five (5) friends to join, and they did so more than a month ago. To date, I have ZERO points as a result of their joining up. What’s up??? Unfortunately (as it often goes) a handful of people ruined it for all the honest folks. We had to put some protections in place. So now, the “inviter” earns points once the friend makes a stay. We’ve enhanced the Invite-Friends page so now you can track which of your friends have enrolled through your unique URL. You’ll also be able to tell who stayed, earning you points. Collectively, we want to make you “Happy David,” so let us know how we can help. Keep the feedback coming! We love hearing from our members, happy or not. Well, if it was such a disaster, why not say so to everyone instead of making folks wonder and wait. Playing “I’ve got a corporate secret” never seems to be popular no matter how many times businesses roll that one out. More often than not, the encore is settling a class action lawsuit, right? And, if it was such a disaster, why do you continue to utilize those legitimately harvested folks/emails for your ongoing marketing campaign? I complied with the rules and regulations… why am I punished? Sorry, I should have been more clear in my initial response: This was not a recent change. We’ve had the program set up this way (“inviter” get points after friend completes a stay) for several years now. The policy, the rules, and the language on the site have been the same for the past several years. The only recent change is that we now provide tracking information on your invites so that members have a clearer understanding of the status of their invites. I’ll talk to our site team to see if there is a way we can emphasize this more clearly in the user experience. Again, I’m so sorry for the confusion. why not have a Stash credit card? Stash played games with the original points offer. You still solicit my friends who signed up but never properly awarded points to me. So why trust Stash now? Thanks for reaching out. We are always considering new ways to add value for Stash members. It’s always helpful to hear what program enhancements our members are interested in. A credit card is currently under consideration, but it’s a big (and complicated) decision that we are weighing very carefully. Stay tuned! Thanks again!